India's Ganges River is a paradox: The mighty river's tributaries are cool, Himalayan-glacier fed springs. But where the river meets Indian subcontinent's highly populated cities, and pours out into the Bay of Bengal, the water goes from crystal clear to trash-and sewage-infested sludge. Prime Minister Narendra Modi committed $3 billion in 2015 to clean up the waterway that provides drinking water for 400 million people — and is revered as a place of worship for over a billion Hindus — but a recent audit found that less than a quarter of those funds have actually been used to help the situation, according to Reuters. And the Ganges, or the Ganga Mata (Mother Ganges) as it's called by India's devout, is in bad shape. Untreated sewage flows directly into the river where people cook, bathe, and perform burial rites for the recently-deceased. Factories and farms from industries as varied as leather tanning to shipbuilding line the river's banks, dumping dangerous chemicals into the river. Modi's government set a target to improve the river's water quality by the beginning of 2018 — but it looks like that goal won't be met. The Ganges begins in the Himalayas as a crystal clear river high in the mountains, but pollution and excessive usage transforms it into toxic sludge on its journey through cities and industrial hubs. As the rivers flows into more populated areas, it gets filled with runoff and sediment from the surrounding cities. Here, the river takes on a muddy hue in Kanpur, in India's northernmost Uttar Pradesh state. Untreated sewage flows directly from drain pipes into the river. Further down the river, in Kanpur, layers of foam form among the sewage in the river. Though polluted, people use the river for bathing, cooking, and washing. A man bathes among sewage foam in Uttar Pradesh. Beyond sewage, piles of garbage are dumped directly into the river, especially in urban areas where authorities do not regularly collect trash. Multiple industries line the banks of the Ganges, drawing on the river's water to power factories, transport goods, and dump waste. In Kanpur, leather tanneries line the banks of the river, dumping industrial waste directly into the river. Dyed leather — which uses harsh chemicals — are seen here drying near the banks of the river in Kanpur. Further South, in Kolkata, brick kilns use the clay and sediment from the river. The kilns pump noxious fumes into the air, which further exacerbate the water quality issues. Here, workers repair a boat in Kolkata. The Ganges is holy to over a billion Hindus. Statues, like this one of the goddess Kali, are doused in the river's water. In a telling scene, a damaged idol of Hindu goddess Kali is seen lying in the river. The river's water is considered holy by devout Hindus. Here, a man pours holy water on the polluted banks of river Ganges beside the idols of Hindu god and goddess that were immersed during the Durga Puja — a holy festival — in Kolkata. 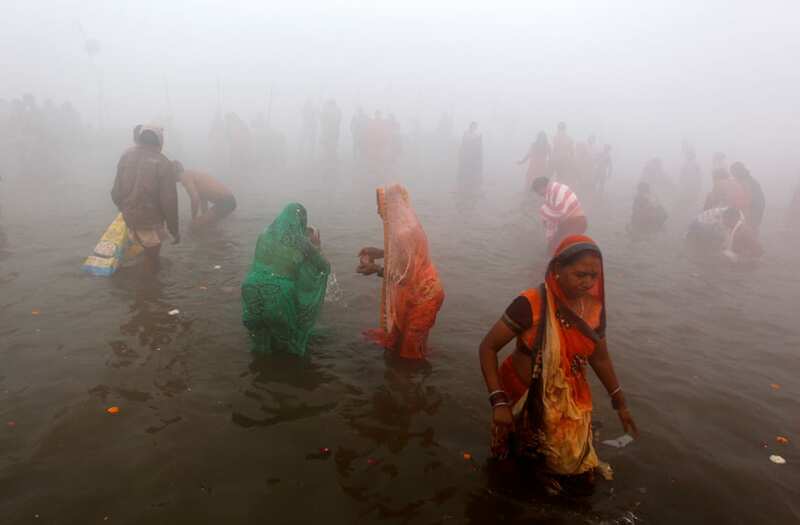 Devout Hindus immerse the bodies of the recently deceased in the holy river water prior to cremation in Varanasi, the spiritual capital of India. Right near the area where the burial rites are performed, Varanasi locals use the Ganges river for bathing and cooking. Some people sleep on the banks of the river, too. Pilgrims swim in the river to purify themselves, even with trash strewn about the beach. Here, boys swim where the river pours out into the Bay of Bengal. Despite local citizens' best efforts, the river remains heavily polluted. Though the Ganga Mata can be filthy — there are still moments of sublime beauty on the holy waterway. Here, a ferry passes through Kolkata at dusk.